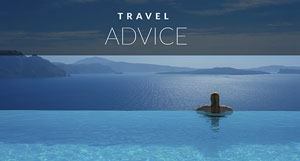 Intense traveling can lead to a temporary fatigue, where every temple, tomb, and bazaar looks similar. 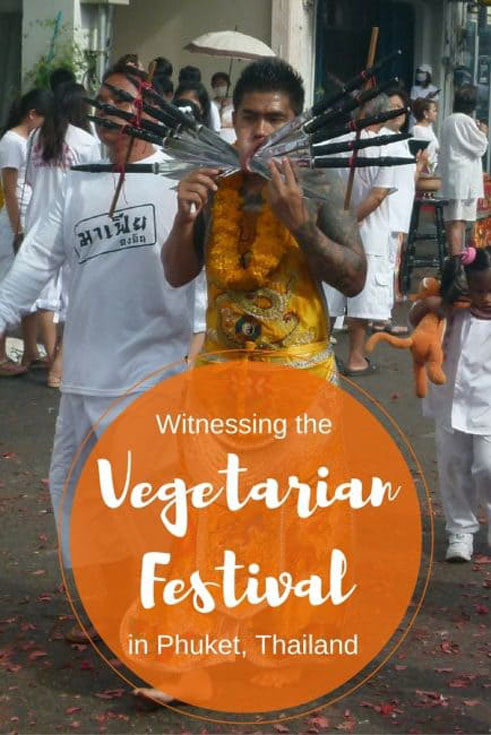 If you feel like you've seen it all, I encourage you to attend the annual Vegetarian Festival in Phuket. No matter how many times you've experienced it, you have yet to see all that can protrude out of a human face. The skewers, spears, guns, and flower baskets have all been done, but what about the selfie stick? Maybe it's coming next October. 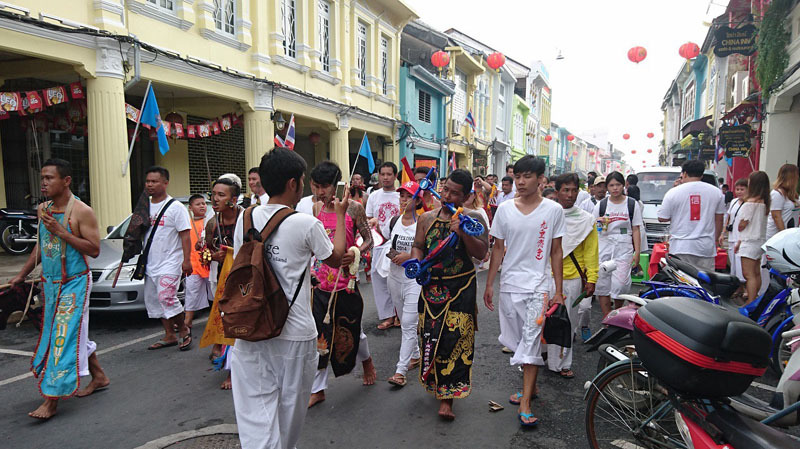 The gory street processions of the vegetarian festival gather the biggest audience, from hordes of white-clad local believers seeking blessings to audacious tourists playing paparazzi in front of the bleeding, shaking devotees called Ma Song. 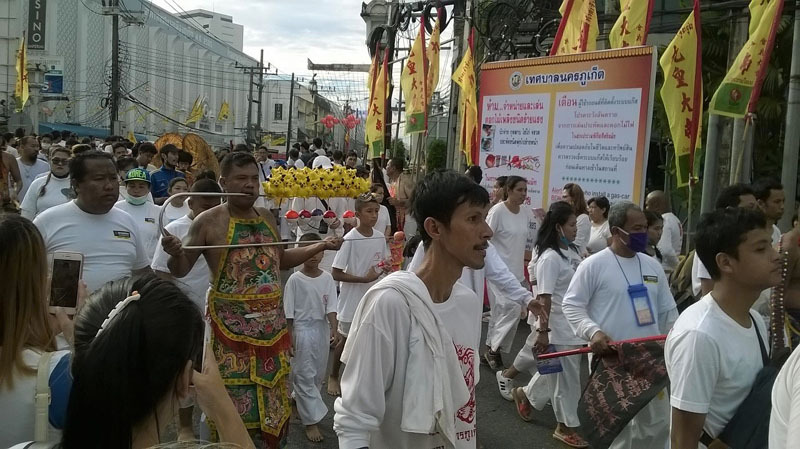 However, by this time the festival has gone on for several days, and numerous other rituals have taken place. Going vegetarian, it's safe to say, is the easiest of them. The Vegetarian Festival is similar to Thaipusam in Malaysia when it comes to skewers and hooks in the skin. A week after this year's festival, I caught up with Krin Somsri, known as Golf – all Thais go by nicknames in daily life – at the restaurant where he works. 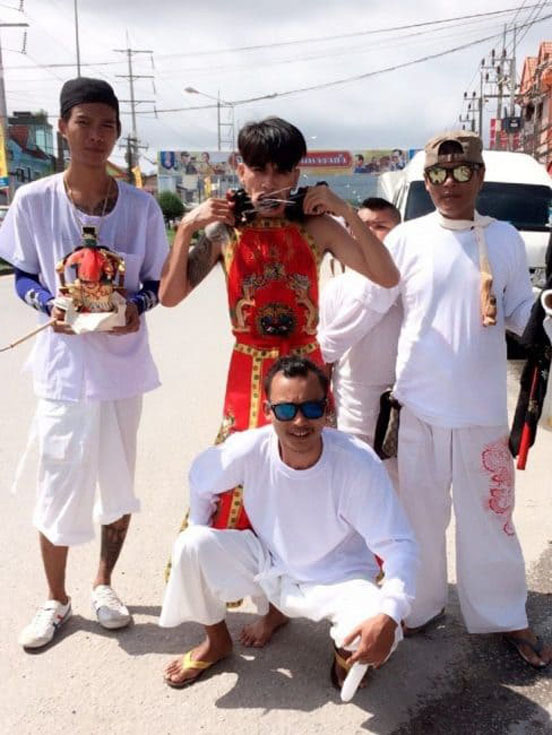 He seems like an ordinary young man, until he tells me about his resident spirit, a Chinese soldier named Djeng Hoo Hong Eya. A trained eye could have spotted the surprisingly small scars, which blend with Golf's dimples as he flashes a bright smile. In Phuket, they can only mean one thing: he is Ma Song. At twenty-three, Golf already has five, or maybe six festivals under his belt. It's such an integral part of his life, he can't quite remember. His father became Ma Song before Golf was born. Learn about the importance of responsible tourism in Thailand. 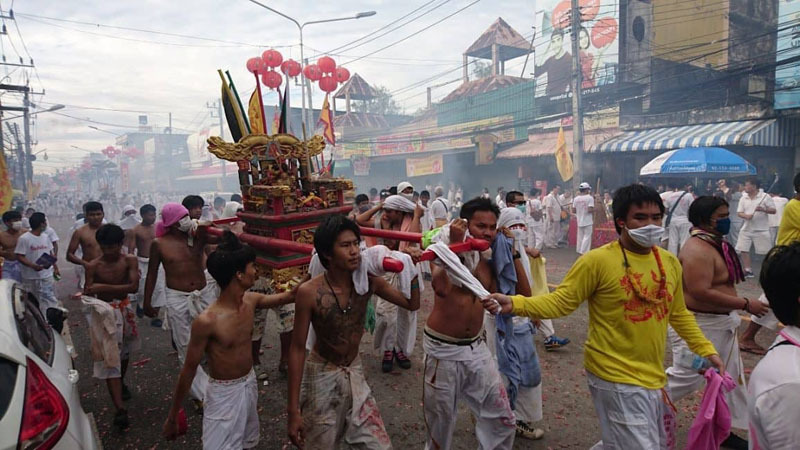 The Vegetarian Festival goes back nearly two centuries, to when a group of Chinese artists visited Phuket, and fell ill with an unknown disease. They were able to heal themselves by invoking emperor spirits and practicing ritualistic vegetarianism. The local population was in awe, and embraced this new knowledge. At the start of the festival, a large pole is raised at every temple, so the spirits can descend and take over the Ma Song. After the festival, the spirits once again leave the island. One does not become Ma Song by choice. The spirits are the ones who choose which bodies to enter. They target those with distant Chinese ancestry, like Golf, but I'm told of a Thai Muslim woman who became possessed just the same. Golf was sixteen when it happened to him. He was watching the rituals, when he suddenly felt air enter his body, causing him to shake violently. This was followed by a fever high enough to send him to hospital. The next year he participated in the rites, which include running on hot coals, climbing up a bladed ladder, and whipping oneself with branches dipped into boiling oil. The piercing had to wait until he turned eighteen. Taken out of context, this may all sound extreme. However, Thailand has deeply entrenched beliefs in the supernatural. There are auspicious days to buy a car, and unlucky days to get a haircut. Mysterious illnesses and events are often blamed on ghosts, and the fear for them is real. Most homes and businesses have a small spirit house next to them. The world of the living overlaps with the realm of the unseen. Golf shows me video footage of a shirtless Ma Song, smoking away in a chair in the temple courtyard. His feet are tapping the ground, a sign of the spirit making its way in through the feet. A member of his support team removes the cigarette, and the Ma Song bends over to burp out the air which has entered his body. A few seconds later, he bounces up from his seat, kicking and shouting, arms slicing the air. As his body settles into a steady shake, his team dresses him in the apron-like ritual clothing. He's ready for the piercing. The next video shows cheeks being punctured with a metal cone. The instrument creates a clean wound, which can be stretched as large as necessary, and in most cases won't need stitches to close afterwards. The deeper the trance, the less pain the piercing causes. Why do Ma Song's Take on Physical Pain? The Ma Song take on this physical suffering so their loved ones would be spared from pain. Everybody is afraid of the piercing, Golf tells me. The first time, he only used two long knives on his face. These days, he'll go for eight. The devotees choose which item to use, and whether to pierce the cheeks, tongue or the skin on the arms – or all. For some, the instructions show up in a dream. Others pick something significant to their spirit. The seemingly nonsensical objects all have a purpose. A pair of giant lollipops, for example, is for a Chinese god figure who is depicted as a child with lollipops. Most female Ma Song chooses not to participate in the piercing. Three people within earshot of our conversation chime in, saying they won't go near the rituals out of fear of becoming possessed. Once you become Ma Song, you are Ma Song for life. If you don't go through the rites to pacify the spirit each year, it will reprimand you, in sometimes scary ways. Furthermore, the Ma Song keep shrines at home for the spirits. Every few days, Golf prepares an offering of fresh tea and fruit. The tea disappears from the cup. The fruit loses its sweetness like the sugar was sucked out of it. If he goes out of town, a family member must keep up the shrine. Otherwise, there will be consequences. In Thailand, that's a risk no one in their right mind would take. 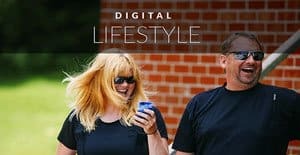 What's the most unique festival you've attended around the world? Check out these adventurous things to do in Thailand. Zaina Brown is a professional bellydancer, relentless traveler, writer, and filmmaker. She began her dance career in her native Finland before relocating to the US in 2003. After years of dancing in the New York area, Zaina took her career overseas. She has worked as a bellydancer in Egypt, UAE, Bahrain, Yemen, Tunisia, Mali, Morocco, Algeria, Turkey, and India.
. Zaina is currently based in Phuket, Thailand, and writing a memoir about the thrills and hard knocks of dancing in the Middle East and traveling solo in Africa, Asia, and Arabia. Follow her on www.WorldOfDancers.com, as well as Facebook, Twitter, YouTube, and Instagram. 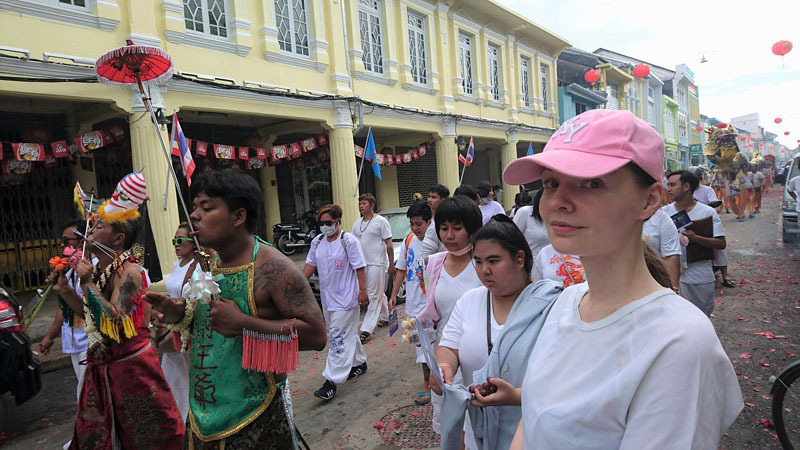 12 Responses to "Witnessing the Gory Vegetarian Festival in Phuket"
Excelente artigo, ficou ótimo, parabéns. Hi! 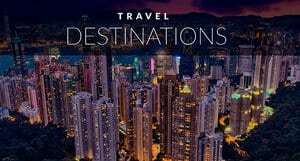 I have been working as a flight attendant and like exploring Asia. 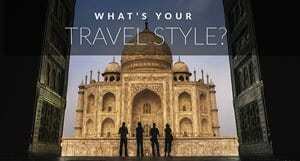 Click here http://mywonderasia.com to find out many interesting facts about Asia, its people and best places to visit. Thank you! It`s fantastic. In next year I go Asia and want to visit Thailand, Malasia. This is not life, it must be very painful to live this way.